Watering grass may not be considered rocket science. But it helps to know how to keep your lawn hydrated and your water bill low. Grass needs about an inch of water a week from either rain or manual watering. If your yard hasn't seen much rain, here are some helpful tips for watering your lawn. When you water your lawn, you want to do it for an extended period of time so that the grass is deeply hydrated. Frequent shallow watering causes shallow roots to grow. This makes your grass vulnerable to drought, disease, weeds, and other issues. So, instead of watering daily, you may want to water the grass two to three times per week for a longer duration. By watering early in the morning, you are giving your lawn a lot of time to absorb water before it gets particularly warm and sunny. During the heat of midday, the water often evaporates so quickly that it doesn’t significantly hydrate your grass. A lot of people know this and consequently, try to water grass at night. The problem with regular watering at night, though, is that it can leave your lawn damp for an extended period of time, making it susceptible to fungus and disease. So, that’s why morning is best. But if you can’t water in the morning, watering at any time is better than letting your grass remain scorched. While most grasses respond well to deep watering a few days per week, there are some exceptions. 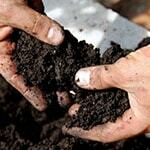 If your lawn seems to have a hard time absorbing water, your soil may have a high clay content. It's vitally important to investigate your soil type to make the right irrigation decisions. In the case of a clay-based soil type, you will want to water more frequently for a shorter amount of time. "Deep watering" is probably not the answer for clay-based soil because the soil needs extra time to absorb the water. Dig into the soil to see how much the water is penetrating. If grass roots are not reaching beyond 2 to 3 inches, your soil is likely compacted and would benefit from aeration and/or dethatching. Healthy grass roots should reach at least 4 inches into soil. It’s easy to forget how long you’ve been watering when you are doing other things at the same time. A timer will help you stay on top of the task. Starting at about $10, these timers automatically shut off the water after you have achieved your time goal. Follow these 5 tips and your lawn will be healthy and hydrated in no time. 5 Helpful Tips for Watering Your Lawn.. Our Power Equipment Direct how-to library can help you learn about How to Fertilize Your Lawn, Vote for Your Favorite Brands in Mower Madness 2019 and Official Mower Madness Contest Rules.